Universal energy flows through and around our physical body through chakras – a Sanskrit word that means wheels or discs. It is estimated that there are 88,000 chakras in the human body. Out of these, there are 7 major chakras that are expressed in the physical body in the endocrine glands that regulate physical and emotional processes in the body. Chakra Diagnosis offers a method of investigating which chakras are blocked due to an associated negative emotion, and then removing the blockage by using affirmations. A Reiki treatment consists of laying the hands on the body in a prescribed pattern and allowing the energy of life to flow through the hands to the person being treated. The basic element of life energy is the essence of this healing practice. Because this is so, Reiki can be used in any situation where there is a desire for and openness to healing. Culturally, we know little about this element of life energy. It is in the practice of the art, consciously being with this energy, that we learn more and become more aware. The form of treatment is simple while comprehensive. The basis of the practice is self-treatment and treatment of others within the realm of family and friends. Theta Healing™ is an amazing new set of techniques that allows you to quickly identify deeply held blocks in order to reprogram the powerful unconscious mind. Theta Healing™ allows you to re-create your reality and hence choose the world you live in. This is achieved through changing – literally re-writing – your feelings and beliefs. It is beliefs , rather than simply luck, that sets apart people with amazing success, health and happiness. 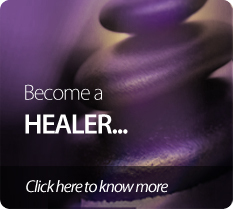 Theta Healing™ is a form of "Divine" healing - it involves working with the highest Consciousness in the universe. As Theta healing is not based on any religion, you can choose to refer to this Consciousness in any way you choose, such as God, Creator or Universal Source. All that is required is the acceptance that there is a higher intelligence we can work with to powerfully transform our life. Check www.thetahealing.com for more details. This is a form of healing that uses crystals or gemstones, which are placed on the body on the various chakras - wheels or discs through which Universal energy flows. As each chakra has a color associated with it, placing a crystal or gemstone of a particular color on the affected region will help direct energy flow towards this area and create balance in the energy body. If an individual that has a particular issue that is recurring, crystals can even be worn on the body in various forms, or placed in an area in which an individual spends a large amount of time such as the bedroom or workplace. This is a complete understanding of direction, geography, environment and physics. There is no room for rituals and superstitions. Vastu for success in business, financial success, Educational Institutions, Gas Agency, Garage & Parking, Hospital, Sickness. This is an ancient Indian energy healing technique with a series of abundance manifestation processes. Kriya means action and Shakti means energy. Key to radiant health, true wealth, richer relationship, spiritual growth and a lot more... All happens effortlessly as you apply simple energy healing principles when you learn to raise the frequency of your personal magnetism. An experience that will touch your soul. Emotional Freedom Techniques (EFT) teach individuals methods of achieving emotional stability by working on the energy meridians of the body. This allows the energy to flow naturally through the body and restores emotional balance. Hypnotherapy is a treatment that is based on the premise that the mind and body do not work in isolation. By sending the patient into a hypnotic state, the therapist aims to trigger the body's mental and physical self-healing processes that lie in the subconscious. Hypnotherapy can be used to treat a variety of issues – physical, emotional and mental – such as overcoming phobias, ceasing problematic habitual behavior, dealing with stress. It can also be used to deal in conjunction with conventional medicine to deal with physical ailments.